Such a convenient hotel for hospitals, shopping and interstate connections for travelers visiting Birmingham, AL. The food is very good and the staff very helpful. Parking is good and close to the elevators. I came to Birmingham to visit family and stayed at this Marriott and it was a delight. The staff were wonderful as I checked in. My room was exceptionally clean and checkout was a breeze. Someone always greeted me as I entered and exited the hotel too. Overall a wonderful stay. Andrea at the front deserves an award. When we arrived, she had a lobby full of screaming kids and upset parents on spring break who arrived to find the hotel overbooked by accident. She and the rest of the staff handled it beautifully and got us into the room we required. The next morning we came across a couple of those families and they were all satisfied with the outcome of their predicament they faced that evening. The hotel staff spent all night making sure that families who had to cram into one room for the night has ample mattresses, sheets, and pillows. This hotel is conventionally located right off of 280 and I-459 in an extremely safe area. The Summit shopping center with Saks, Fleming’s, and other high end stores is less than a 5 minute drive. Perry’s Steakhouse is less than 3 minutes away. The lobby and rooms have been recently renovated and everything looks brand new. The club lounge has been moved to the lobby area and it’s beautiful. The only issue we had was that it’s closed on weekends for drinks and food. Why?? It’s still open to get some quiet respite and non-alcoholic beverages but again, why?? There’s a lot of us working on weekends. And a lot of people that would like to have a weekend adult getaway the full club lounge in full swing. Another stand- out was our server, Shane, in the restaurant/bar area. He went above and beyond to help us at breakfast. This guy is manager material. Hope you’re reading this Marriott. Don’t waste your time staying here. My husband and I stayed here over the weekend with our teeneage sons. We were in town for an AAU basketball tournament and booked for a double room (2 queen beds). When we arrived Friday night we were totally disappointed to see that there were 2 full size beds. You all should state on your website the correct sizes of the bed. Stop fooling people. Around 6:45 am on Saturday my husband called to request extra towels and we were told that house keeping doesn’t come in until 7:00 am. Okay. So we are not allowed to have towels until housekeeping arrives?! Unbelievable. We called twice after 7:00 am only to receive our towels at 7:45 am. Very poor customer service. We had the same issues with housekeeping again this morning only this time it was worse. We requested towels 5 times and never received what we requested until after our youngest son had to take a shower with no towel. The young lady in housekeeping kept bringing us the wrong size towels. My advice to the Birmingham Marriott is to hire a more competent staff. We never should have been told that we couldn’t get towels because housekeeping was not at work nor should we have not received what we asked for. Needless to say we won’t be returning. I stayed here for business the week of May 4th. The room (on 1st floor) was recently renovated. The room was clean with the traditional amenities you would expect in a Marriott. I am platinum...but no upgrade...although the hotel was relatively empty. The lounge is nice with nice snacks and beverages 24 hours a day. We were in town for a team event and this was the team hotel. Overall the hotel is very clean and up to date. The hotel is on a very busy highway, but sits back and up off the road so there was never an issue with noise. There are also many restaurants and shops very close by. The staff were very accommodating to our group, even turning all of the televisions in the lobby to the channel we wanted and allowing our group to hang out even in the middle of other events at the hotel. One negative I noticed was it took housekeeping until around 4 or 5 o’clock in the afternoon to come and tidy our room up. I have never been at a hotel that took so long to freshen up a room. I understand they are trying to turn over the rooms where guests have checked out first, but maybe more staff is needed. From check in to check out, this property was amazing. The staff was as friendly as could be. The renovated rooms and lobby are awesome. Add in an "M" club and bar with a cool vibe and you check all the boxes. Oh forgot to mention the excellent gym. We wish we were able to stay longer. Located within 2 miles (3 km) of The Summit, Birmingham Marriott is within 3 miles (5 km) of Altadena Valley Golf and Country Club. This 295-room, 3.5-star hotel has a restaurant, an indoor pool, and a 24-hour fitness center. Sit down for a leisurely bite to eat at the onsite restaurant, or enjoy a drink at the bar/lounge. Satisfy your hunger from the comfort of your room with room service. For your convenience, a buffet breakfast is available for a fee. Guests can expect to find WiFi and 49-inch a Smart TV with digital channels and Netflix. Pillowtop beds sport premium bedding and down comforters, and the bathroom offers a hair dryer and designer toiletries. Other standard amenities include a refrigerator, a coffee maker, and free weekday newspapers. 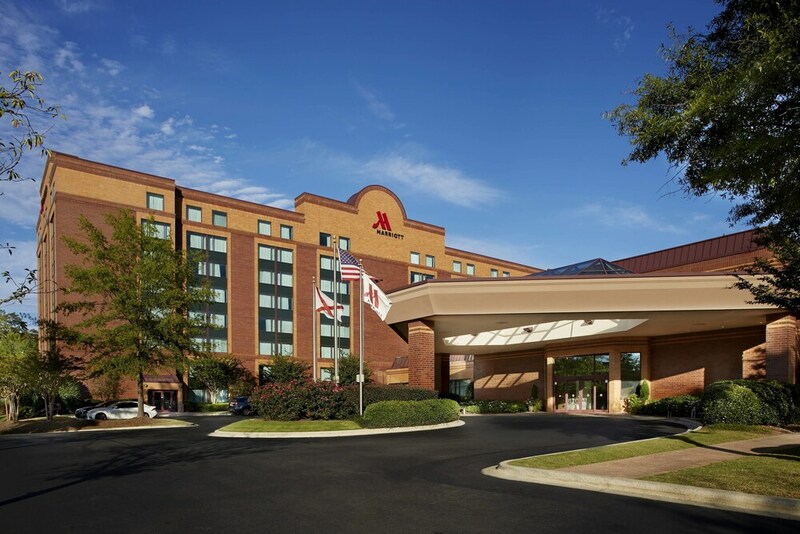 Guests staying at Birmingham Marriott enjoy an indoor pool, a 24-hour fitness center, and WiFi in public areas. There's free parking and a free area shuttle. Front-desk staff can answer questions 24/7, and assist with concierge services, dry cleaning/laundry, and securing valuables. Additional amenities include a meeting room, a 24-hour business center, and coffee/tea in a common area. Marre & Allen - Restaurant and bar specializing in American cuisine and serving breakfast, lunch, and dinner. Recreation features at Birmingham Marriott include an indoor pool and a 24-hour fitness center. The preferred airport is Birmingham, AL (BHM-Birmingham Intl. ): 21-min drive, 13.7 mi/22 km.